Alright, we've been getting requests (OK, just one) for more of our cocktail series. And we know that many ladies like to bid a sweet farewell to the single life with fruity cocktails. Whether you're the bride-to-be or the person in charge of planning her bachelorette party, we have some recipes that might interest you. 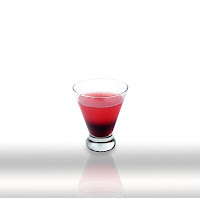 To keep it simple, all of today's cocktails are made with the X-Rated Fusion Liqueur. Strain into a highball filled with crushed ice. Top with soda. Pour ingredients into mixing pint over ice. Shake vigorously and strain into martini glass. Garnish with blood orange. Let us know what you think of these. Or better yet, give your own recommendations!